Medium (12-18 Mos) - $66.99 Only 1 left! Your newborn fish might be a little koi right now, but there's no need to be afraid of being a fish out of water... especially when it's your first Halloween! That's why you shouldn't let that shyness fool you. Trust us, your little fish is just itching to get out of the family bowl and swim around in the open sea (as long as mom and dad are close, of course) on the big night. So suit them up in this adorable Infant/Toddler Giggly Goldfish Costume and make a big splash this Halloween! Decked out in rich details and full of quirky character, this outfit will make your little one look like the biggest fish in the pond! It's a deceptively simple jumpsuit with a fleece outer shell and satin lining. The front "bib" area is covered with scales that have a subtle glittering effect (because a goldfish has to earn it name, doesn't it? ), while the sleeves end in decadent fins that will make the rest of the school completely envious of your fish. Meanwhile, the booties make your baby's feet look like little flippers, and the best part of the costume? That's easily the hood, which creatively puts his little face in the mouth of a lovable goldfish character. From head to toe, the outfit is a highly detailed cuteness overload! And it's got some nice features for mom and dad, too. The jumpsuit opens and closes easily at the back, and the inseam opens as well, because sometimes little fish have... well, little accidents (and need a change of diapers)! 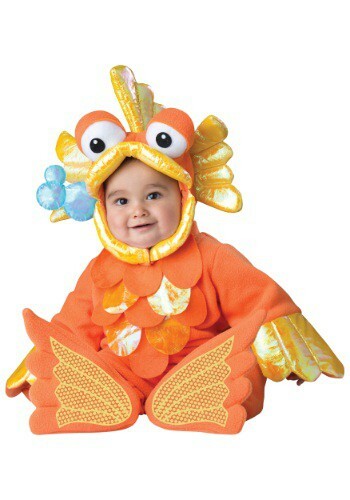 The Infant/Toddler Giggly Goldfish Costume is truly easy and convenient for both baby and parents!